Please contact for sales or service. Our experienced sales and technical teams, have been in the business of helping healthcare facilities improve nurse/patient communication, protect infants, patients, staff and property since before we opened our doors in 1999. We offer the most reliable, flexible and affordable nurse call systems on the market. Our advance microprocessor based nurse call systems have remained reasonably priced, while many competing systems have gone through the roof. Why? Most of Tektone’s competitors have been taken over by large multi-national corporations and medical equipment companies. They are used to charging high prices and you are used to paying them. Tektone nurse call systems are manufactured in America by a well established family owned business. They have been making quality nurse call systems for a reasonable profit, since the 1970’s. The Tek-Care 400 leverages the most current technology available and comes with a five (5) factory warranty on all the equipment. So the next time you need to upgrade your nurse call system, take a look at one of ours. We can save you as much as 25% on the base system versus some our more well known competitors’ systems. You can spend the savings getting something else you need, or you can get much further up the wish list of integrations your nursing staff has put together. SO GO ON! MAKE YOUR NURSES HAPPY. GIVE US A CALL. Providing for the common defense is the very root of why we band together to form a government. There is no higher calling and no greater service than putting on the uniform to defend the homeland. We sincerely thank you. 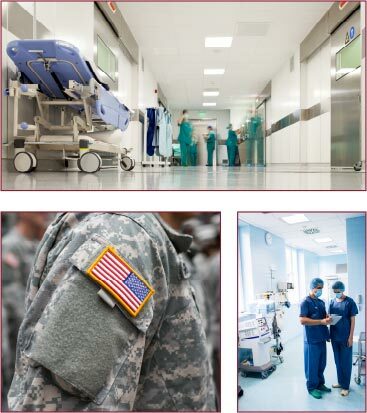 Freedom Communications, Inc. is a leading supplier of Fire Alarm and Mass Notification systems for military base use. Our Gamewell-FCI Fire Alarm Panels and Honeywell Security equipment help provide a safe working environment for our troops, while they are busy providing a safe homeland for our families. All of our Gamewell-FCI Fire Alarm and Mass Notification systems comply fully with the Department of Defense Universal Facility Code (UFC).